Knoxville: Summer of 1915, Samuel Barber’s setting of a prose poem by James Agee, evokes sweetly nostalgic childhood memories of summer. Elgar created his Enigma Variations as a musical gift for his wife and closest friends. With exuberance, humor, and warmth, he presents a separate variation—akin to a musical portrait—for each of them. Boston composer Peggy Stuart Coolidge composed The Blue Planet to accompany a poem written by her husband. In 1971, the World Wildlife Fund adopted it as their official theme song. Channing Yu and his Mercury Orchestra have thrilled Boston area audiences every summer for a decade. Through skill, devotion, and truly ambitious repertoire some of the most talented amateur musicians in the region come together each year to deliver invariably memorable performances. 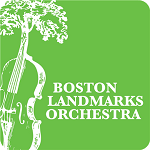 This summer for the first time, they appear on the Esplanade as guests of the Boston Landmarks Orchestra. The drama of Beethoven’s Ninth Symphony—a journey from darkness to light—is one of the glories of Western art. Beethoven believed in music’s power to redeem a suffering humanity, to bring us closer to heaven in this life. His music to Goethe’s play, Egmont, came at the apex of his “Heroic Period.” The story honors the sacrifice of a nobleman condemned to death for resisting tyranny. The sublime Romance in F for solo violin and orchestra is among Beethoven’s most sweetly lyrical instrumental works. Fired by local pride, some of Western music’s most passionate works are closely identified with their cultures of origin. At its premiere, Finlandia was heard to symbolize Finnish independence. It is now considered a second Finnish national anthem. Dvořák urged American composers to borrow from the spirituals, much as he had employed Czech folk songs in his own writing. 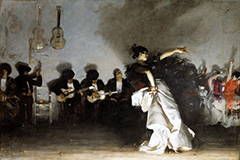 Márquez’s Danzón No. 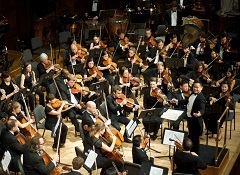 2 has become one of the most popular of all orchestral dances. The young musicians of ZUMIX are featured in a Landmarks-commissioned work they have created with composer Gonzalo Grau. *Prior to the concert, we will host an Instrument Playground on the Esplanade where youth can explore different instruments and make their own music! The Instrument Playground starts at 6:00 pm. Boston’s medical community orchestra has been a leader in innovative programming and community engagement for thirty-five years. 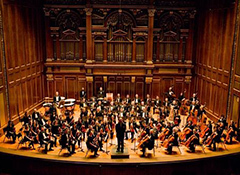 Recognizing that music is at its essence a healing art, the Longwood Symphony serves the Greater Boston area through performances and programming related to the services these musicians provide in their medical professions. Music Director Ronald Feldman conducts. 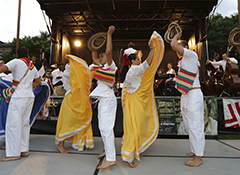 “Music to move by” from many cultures features dancers from across the city. Composer and drummer Ryan Edwards teams up with Apostolos Paraskevas to create a new work for young drummers and dancers from Camp Harbor View and the Boys and Girls Clubs of Boston. The evening culminates in a grand performance of Copland’s Rodeo with choreography by Peter DiMuro. It will be hard for anyone to sit still for this season finale. 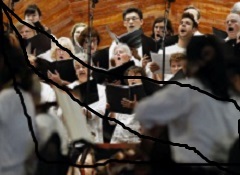 But at Boston Landmarks Orchestra concerts, that’s perfectly okay. 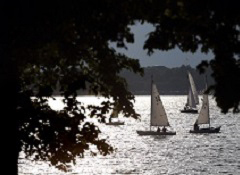 Rain Date: August 24 at Hatch Shell. *By arrangement with Boosey & Hawkes, Inc., publisher and copyright owner. 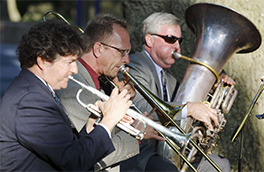 The Landmarks Brass Quintet will play outdoors for a free, lunchtime recital at Harvard Business School, Boston, MA 02163. Pinebank Promontory, adjacent to Jamaica Pond, presented in partnership with the City of Boston Parks and Recreation Department and the Emerald Necklace Conservancy. This event will also include a musical instrument playground. Location: Rose Kennedy Greenway (In the portion of the park between Oliver Street & Pearl Street and also bounded by Atlantic Avenue). Music of the wilds and the countryside. Tan Dun’s Secret of Wind and Birds mimics sounds and colors found in nature, incorporating birdsong activated by audience members on their cell phones. Michael Gandolfi’s tribute to a garden in Scotland follows a tradition first established by Respighi, who introduced recorded birdsong into concert music in 1924 with his brilliant Pines of Rome. In partnership with Conservatory Lab Charter School; Boston University Tanglewood Institute; Mass Audubon; and The Garden of Cosmic Speculation, Scotland. Peggy Fogelman, Director of the Gardner Museum, co-hosts an evening honoring the life and passions of Isabella Stewart Gardner. 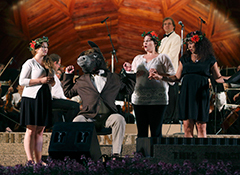 Highlights from the museum’s collection and images from the Rockwell Museum in Stockbridge, MA—projected above the orchestra—are shown in coordination with the music. Mussorgsky’s Pictures at an Exhibition is performed in Ravel’s masterful orchestration. Check out the wonderful video preview of this concert from our friends at the Norman Rockwell Museum! One of the greatest dramatic singers of her generation, Jane Eaglen, soprano, headlines a powerhouse program. Highlights from Wagner’s Ring include The Ride of the Valkyries and the dramatic final scene of the cycle. The stirring Anvil Chorus precedes the New England premiere of a major work by Verdi, Libera me, a work which five years later he transformed into the dramatic conclusion of the Requiem. 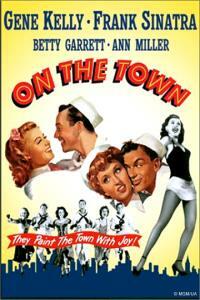 This evening we give the orchestra a well-deserved night off, and screen the classic 1949 movie musical On the Town, starring Frank Sinatra, Gene Kelly, and Ann Miller. The film is based on the 1944 Broadway musical by Leonard Bernstein, which in turn is based on his ballet Fancy Free—which the Landmarks Orchestra performs on August 17. Hit songs such as ‘New York, New York’ and Kelly’s iconic dancing are among the highlights. 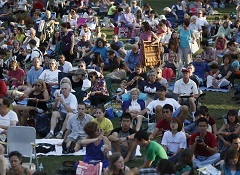 Pack your picnic for an old school Hollywood musical film under the stars. An open-air festival of sundry styles and celebrated classics. Musical treats from Gershwin to Adams to Grieg accompany the great Fifth Symphony of Tchaikovsky. All-Stars from East Boston’s ZUMIX unveil their new pop-inspired creation. The night comes to a fitting close in collaboration with the Boston Area Brigade of Activist Musicians (BABAM!). *Due to severe weather in the forecast on August 10th, this concert has been rescheduled to Thursday, August 11th at the DCR’s Hatch Shell. Movers and shakers from across the city converge on the Esplanade for a celebration of American and international dance. Leonard Bernstein’s Fancy Free takes pride of place in an original interpretation by Yo-El Cassell and Boston-based performers. Youth from area Boys and Girls Clubs will “shake the Shell” along with outstanding companies of Armenian and Latin America dancers. 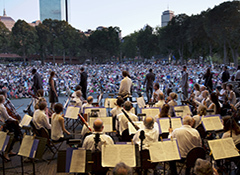 The annual performance at the Hatch Shell by Boston’s medical community orchestra, always an innovator in programming and community engagement. 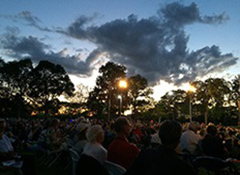 Promoting music as a healing art, the Longwood Symphony serves the Greater Boston area through performances and programming related to their professions. A landmark Broadway musical from the swing era is reborn on the Esplanade. 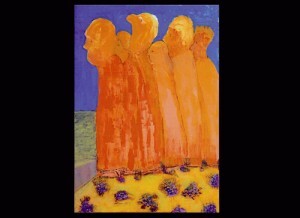 The Boys from Syracuse, based on Shakespeare’s The Comedy of Errors, is often considered the finest of all Rodgers and Hart creations. Familiar songs include ‘Falling in Love with Love,’ ‘Sing for Your Supper,’ and ‘This Can’t Be Love.’ This ‘concert performance with dancing’ marks only the 2nd professional performance of the inimitable big-band style original 1938 orchestrations. 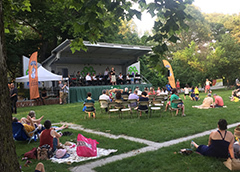 The Boston Landmarks Orchestra is proud to participate in Highland Street’s Free Fun Fridays program for the second consecutive year. This year’s performance takes place at the Institute for Contemporary Art/Boston outside by the grandstand overlooking Boston Harbor. Mysteries of the sea resonate in Debussy’s La Mer and Hovhaness’s And God Created Great Whales, a work featuring actual whale songs provided by the New England Aquarium. Hometown favorite Jayne West performs Berklee Professor Francine Trester’s gorgeous new setting of At the River. Pulitzer Prize winning composer Kevin Puts’s miniature tone poem River’s Rush flows with melodic waves and whirling orchestral color. 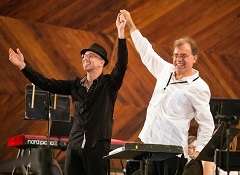 Salsa meets symphony as Alex Alvear’s “pocket-sized salsa orchestra” heats up the Esplanade again this summer. 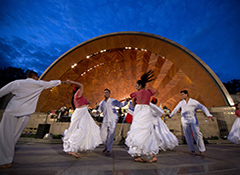 From mambo to merengue, the spirit of dance permeates an evening of Latin symphonic music. Boston’s leading performers of Latin jazz are joined by the folkloric dancers of BAJUCOL and the gifted young musicians of the Conservatory Lab Charter School. 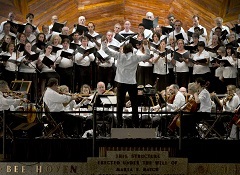 The annual performance at the Hatch Shell by Boston’s medical community orchestra, always an innovator in programming and community engagement. This year’s program “A Night at the Ballet” features familiar ballet music including Offenbach’s delightful “Can-can” from Orphée aux enfers. Music Director Ronald Feldman conducts. The Golden Age of Italian opera is about passion writ large. Its music now occupies a central place on the concert stages of the world. The thrilling voices of two stars of American opera join a coalition of outstanding Boston-area choruses. One of Fellini’s greatest films luxuriates in the festive and lyrical music of Nino Rota—who later composed music for The Godfather and musicians from the famous Honk! festival of activist street bands..
Brazilian pianist, vocalist, and Music Alive: New Partnerships Composer-in-Residence Clarice Assad creates a joyful collaboration with neighborhood ensembles in music inspired by folk dance, storytelling and memories of childhood. Sheherazade, the vibrant symphonic poem based on One Thousand and One Nights is the well-loved creation of Rimsky-Korsakov who, as a Russian naval officer, once set anchor in Rio de Janeiro. 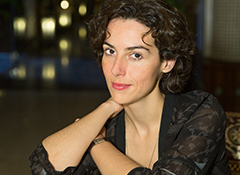 The Residency of Clarice Assad is made possible through Music Alive: New Partnerships, a residency program of New Music USA and the League of American Orchestras. This national program is designed to establish new relationships between composers and orchestras, and to help orchestras present new music to the public and build support for new music within their institutions. Leadership funding for Music Alive is provided by The Andrew W. Mellon Foundation, with additional support from The Aaron Copland Fund for Music and The ASCAP Foundation Bart Howard Fund. The Esplanade resounds with rhythms and dances of many ages and cultures. The Swordfishers features replicas of ancient stone instruments fashioned by a New England culture that thrived thousands of years ago. The Concerto Fantasy for Two Timpanists marks the orchestra’s first performance of music by Philip Glass, one of America’s most influential composers. Rachmaninoff’s final work—the brilliant and rhapsodic Symphonic Dances—caps the night. Boston Landmarks Orchestra pays tribute to visual artist, social justice activist, philanthropist, and true renaissance woman Fay Chandler, who passed away on March 3, 2015. Our program features an eclectic collection of pieces and genres dear to Fay, including Copland’s Fanfare for the Common Man, film music from Lonesome Dove, music by Boston composer Larry Bell, and, fittingly, Joan Tower’s Fanfare for the Uncommon Woman. 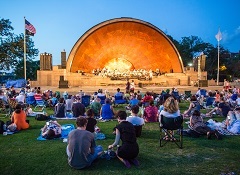 Clarice Assad and Friends will join musicians from the Boston Landmarks Orchestra for a free concert next to Jamaica Pond. Music will include compositions by Ms. Assad and others combining Latin jazz, folk and popular styles with classical influences. 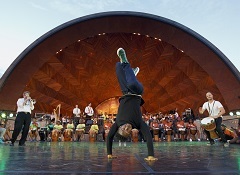 The event, which is presented in partnership with the City of Boston Parks and Recreation Department and the Emerald Necklace Conservancy will also include a musical playground. 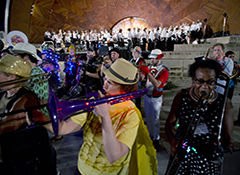 Clarice Assad and Friends will join musicians from the Boston Landmarks Orchestra for a free concert at the JFK Library in Dorchester on August 14 as part of The Highland Street Foundation’s Free Fun Fridays initiative. Selections from Mozart’s Don Giovanni, Verdi’s La Traviata and The Force of Destiny, Janacek’s Katya Kabanova, Rossini’s Cinderella, Sullivan’s The Gondoliers, and Die Fledermaus by J. Strauss II.